Logan Denim Johnson, along with her twin sister, Raegan, was born on June 22, 2014. On September 28, 2016, Logan complained of an ear ache. After going to urgent care and being diagnosed with an ear infection, she went home with an antibiotic. But the pain persisted. 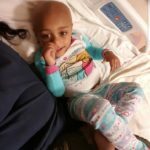 Logan’s mom, Mia Cross, was not satisfied with the diagnosis and the treatment protocol, and took Logan to Medstar Franklin Square Medical Center. By this time, Logan was in tears and in tremendous pain. 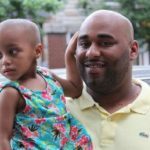 At Franklin Square, they were able to determine that Logan had a form of cancer, but they could not pinpoint it. At the ER at The University of Maryland Medical Center (UMMC), they ran tests for three days and Logan was diagnosed with B Cell leukemia. She was just two years old. The team of pediatric oncologists at University of Maryland Medical Center became Logan’s tending team. Chemotherapy began right away and lasted until December 2018. Logan was also on steroids and many other treatment plans during her 2 ½ year journey. 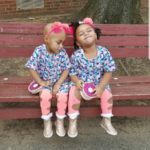 Logan often had to endure hospital stays, which meant not being with her twin sister, Raegan. The girls did not like this arrangement and were able to Face Time each other during the treatment separations. Logan’s parents, Mia and Dad, Dominic Johnson, took turns spending nights at the hospital with Logan. 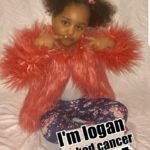 Logan was declared cancer free in December 2018. She will receive scans every three months for the first year and then every six months for the second year. Eventually, she will just need annual scans. Logan adores her shih tzu Kena and enjoys hanging out with her older sisters, Diamond Johnson (15) and Sha’bria McCleod (18). CCF has enjoyed spending time with Logan and her family as she has attended our annual holiday party for the past couple of years. We are so happy she is cancer free! 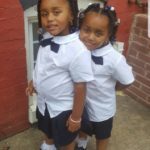 Today, Logan is in pre-K and enjoying being in class with her sister Raegan. She loves to watch and make recordings for YouTube and playing with her LOL collectible dolls.